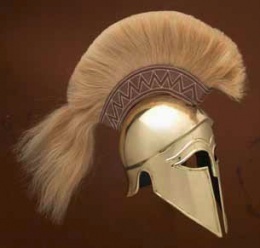 Corinthian helmets originally came out of Greece and was carried to Greek colonies in Sicily, Italy and Spain. Traces have also been found in Celtic graves. This helmet represents a fully refined example from around 400 BC, and is the only helmet in the market made exactly to specifications as was found. Throughout the 5th and 4th century BC, the Greek Helmet continued to evolve, still with a view to improving ventilation, hearing and vision, without sacrificing protection. The Chalcidian helmet continued to be very popular, but improved versions as shown by Deepeeka, with a cranial ridge for better protection appeared. Some pieces also had ear hinges for cheek pieces. The nasal piece also became smaller and disappeared from some of these helmets, giving rise to the Attic style of helmets. Corinthian helmets originally came out of Greece and was carried to Greek colonies in Sicily, Italy and Spain. Traces have also been found in Celtic graves. This page was last modified on 23 April 2014, at 19:41.